Heckler & Koch (the latter pronounced "Coke" for those of you who have forgotten your high school German) is a company whose name recognition with the American gun owner is much larger than its gun sales would indicate. Much of that is due to the worldwide military popularity of many of its long guns, including the G36 assault rifle and the ubiquitous MP5 9mm submachine gun. My boys (ages 10 and 14) would have no problem picking an MP5 out of a lineup solely due to the hours they've spent playing Call of Duty: Modern Warfare. Since neither the G36 nor MP5 are available for civilian purchase, most HK gun sales in this country are handguns. The HK USP (Universal Self-loading Pistol), which was introduced in 1995, has been a successful design. A polymer frame, combined with an interchangeable trigger module and reversible safety/decocker, made the USP popular. It didn't hurt that the USP was basically the little brother of the .45 ACP HK Mark 23 pistol developed for U.S. Special Operations Command. Guns used by our troops are always highly sought after by civilians. Eventually the USP could be found in three different calibers and nine different trigger configurations. Along with the HK45 Compact, the HK45 was developed as a possible candidate for the Joint Combat Pistol and Combat Pistol programs administered by the U.S. military in its search for a new service handgun to replace the 9mm Beretta M9. These programs were suspended before completion, and no pistols were selected. The HK45 is assembled in the United States from U.S.- and German-made components at Heckler & Koch's new manufacturing facility in Newington, N.H. It is a big gun, a 10+1 shot .45 ACP pistol that's almost six inches tall and more than 7.5 inches long with a standard-length barrel. The version I was sent for testing is the brand-new HK45 Tactical, which features an extended, threaded barrel for use with suppressors, and a tan frame and tritium night sights. I would consider this a great duty gun or ideal for the bedside table with a weapon light clamped on the front, but few people would be large enough to carry it concealed. The main exterior difference fans of the USP will note with the HK45 is the presence of a removable backstrap. Two different backstraps are available, allowing the user to better fit the pistol to his or her hand. Backstrap aside, the grip itself is also thinner than that found on the USP. As the USP had a rather large frame, designed around a magazine that held 12 rounds of .45 ACP, slimming the HK45 down was definitely a good idea. The grip shape has been changed as well, with finger grooves molded into the front of the frame, which is fiber-reinforced polymer stiffened by stainless steel inserts. The grip-to-slide angle is the same as found on a 1911. Tan guns are in. I am convinced this is because we have had troops in harm's way in sandy places for more than a decade. Whatever the reason, you are seeing and likely to keep seeing either whole firearms or accessories tinted the color of dirt, whether the manufacturer calls it coyote tan, flat dark earth or some other market-researched term that means the same thing. Personally, if you're not in combat, I think the idea of having a gun the color of the ground you're standing on might be a bad idea, as it only makes it harder to find when you set it down, but that totally ignores one important point: Tan guns are cool. Let's get to specifics. My test pistol, and most of the HK45s you'll see for sale, is a double action/single action with a decocking safety lever (HK calls it the control lever). Officially, that makes my HK45 a Variant 1. The HK45 is like its USP precursor in that it has a modular trigger/safety system, and there are plans to eventually have 10 different variations of fire modes and control functions. The double-action pull on my sample was a smooth, non-stacking 12 pounds. The single-action pull measured five pounds but felt lighter. The control lever is where the thumb safety on a 1911 is usually located. Up is Safe, down is Fire, and all the way down decocks the hammer. The safety can be engaged with the hammer down, and the pistol can be carried cocked and locked. The lever can be switched to the right side of the frame for left-handed shooters. The pistol is capable of being fired with the magazine removed. Both the slide release and magazine release are ambidextrous. The slide release is in the traditional spot, but the magazine release may surprise users not familiar with HKs. Unlike the standard American button mag release on the frame by the trigger guard, the HK has a lever magazine release that follows the contour of the bottom of the trigger guard. This is not a bad thing, just different. How best to work the magazine release? 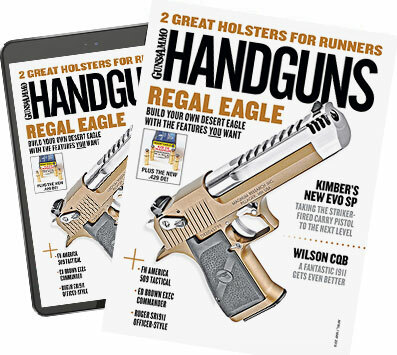 My hands (and probably everybody else's) are too small to work the magazine release with the thumb of my shooting hand unless I turn the pistol nearly sideways in my grip. The quickest way I've found to hit the mag release is with the tip of the middle finger of my shooting hand. I can do that without shifting my grip, and it is only fractionally slower than using my thumb. At the bottom of the frame is a Picatinny MIL-STD 1913 tactical rail for mounting lights, lasers, bayonets, whatever you're in the mood for. The barrel of the HK45 borrows from the USP design in that it has an O-ring to provide a tighter lockup with the slide. Four spare O-rings were provided with the pistol. The standard HK45 has a 4.47-inch barrel, whereas the extended threaded barrel on the HK Tactical was 5.11 inches long. I know there are a number of people who will buy this pistol who don't have any plans to thread a suppressor on the end of it, so I'm a bit surprised HK doesn't sell it with a screw-on thread protector. Also, most factory guns with threaded barrels designed for use with suppressors tend to have extra tall sights so they can be seen above the can, and the HK45 didn't have these. However, extra tall sights can sometimes complicate holster fit. The barrel has polygonal rifling, which always appears underdone to me when compared to traditional lands and grooves, but it works. The flat-topped slide has forward cocking serrations, which I appreciate, and the three-dot night sights worked as advertised. The rear sight is a no-snag design that also has an overhang on the front. This is becoming a popular design feature on tactical rear sights becauseâ€”if you should become injuredâ€”it allows you to rack the pistol one-handed by pressing the rear sight against the edge of a table or something else that's hard. When I was in uniform we practiced racking our guns off our duty belts and holsters, but considering the muzzle of the pistol can end up sweeping your own feet or the guy off to the side, I'd recommend caution practicing thatâ€”and only with an unloaded gun. The top of the slide seemed narrow at the top, but then I realized I was used to the square Glock slide which, while very well engineered, has all the soul and style of a block of wood. The slide of the HK45 is actually contoured and has some flair to it. Two 10-round magazines are provided with the pistol. When I first opened up the gun case and removed a magazine, my first thought was, "That's the biggest 10-round magazine I've ever seen." For as long as it was, I was surprised that the magazine didn't hold more than 10 rounds of .45 ACP. However, after examining it for a while, I realized that the magazine itself was rather thin, and not a true double columnâ€”more like a column and a half. I think HK did this to keep the circumference of the grip down, so users with medium-size hands (such as myself) could still reach the double-action trigger. A side-byâ€“side comparison revealed the .45 ACP HK magazine to be the same width as my Glock 17 9mm magazine. Range work provided no surprises. The HK45 digested every type of ammo I fed it without a problem. For a .45 ACP, the pistol had a pleasant recoil impulse. HK describes it as a "â€¦unique internal mechanical recoil reduction system reduces the recoil forces imparted to the weapon and shooter by as much as 30 percent..."
I love marketing hype as much as the next guy, but this "unique" system consists of a full-length steel recoil spring guide rod, recoil spring and a short polymer cylinder around the recoil spring. The owner's manual calls the cylinder a "sleeve." Switch out polymer cylinder for a Shok-Buff and that's the same combo I've been running in my 1911s for 20 years. The polymer is designed to eliminate metal-on-metal contact during the recoil cycle and extend the life of the gun. However, physics are physics, and there's only so much energy a recoil spring and piece of polymer can absorb, no matter how many adjectives you use. I attribute the HK's modest recoil to several things: a slightly higher than average bore, which meant the pistol rocked in my hand rather than slammed back; and a full-size contoured polymer frame that allowed me to get a firm grip on the pistol. Even stiff polymer frames flex more than steel, and help to absorb some of the recoil, but a 30-percent reduction in recoil when compared to similar size/weight pistols solely due to the recoil spring, guide and sleeve? Sorry, no. The HK45 Tactical is a bit of a niche pistol, but then so is an airweight J-frame. I could try to compare the HK45 Tactical against another pistol on terms of price, but I'm hard-pressed to find a pistol to compare it to. It has European flair, not just in looks but in operation (the unusual mag release) and as a bonus is chambered in the pistol cartridge against which all others are judged when it comes to stopping power. If you're looking for a big reliable pistol with night sights, one that can mount a light and a suppressor if you're so inclined, you should check it out.